Native of Kagoshima, Japan, Mari is known for her sensitive and graceful performing style. With a varied interest in chamber music, solo recitals, and orchestral performances, she has worked with conductors such as Simon Rattle, Charles Dutoit, Christoph Eschenbach, and Alan Gilbert. Her recent performances include Japan recitals in Tokyo and her native Kagoshima, an appearance at Verizon Hall in Philadelphia as one of the soloists for Bartok's Sonata for Two Pianos and Percussion with Curtis Symphony Orchestra, and the world premier and recording of Paul Lansky's Partita: Suite of Guitar and Percussion (Bridge Records). Mari moved to the United States when she was twenty years old to attend Curtis Institute of Music where she earned her bachelor’s degree, and later she earned her master’s degree at Yale School of Music. She currently resides in Kansas City, MO with her husband, Kansas City Symphony concertmaster Noah Geller, and their lovely boxer-pit mix dog, named Monkey. Garrett's richness of sound identifies his sincereness and intellectual curiosity in his performance. His passion in developing the genre of percussion music has inspired many composers and musicians through creative collaboration and workshops. Garrett's commissioning projects include the premier of Book of Grooves by Alejandro Vinao, as well as working with composers such as Martin Bresnick, James Wood, and many young composers. As a past member of Ensemble Connect, Garrett performed the Carnegie Hall premiere of Steven Mackey’s Micro-Concerto, as well as many other performances through New Work City. He also served as a teaching artist for schools and community centers throughout the Five Boroughs. 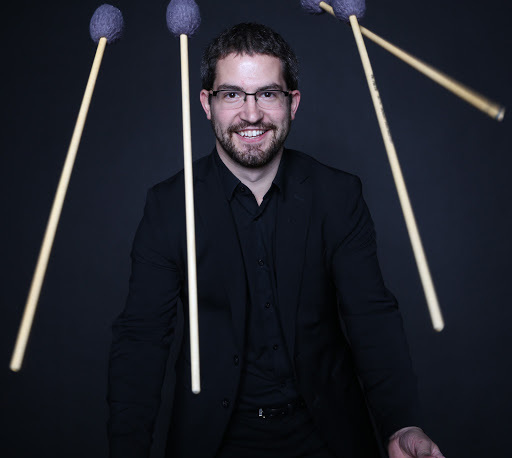 A native of Michigan, he studied at Michigan State University, Peabody Conservatory, and Yale School of Music, and now teaches at Cleveland State University, and is a frequent guest teacher at Peabody Conservatory.